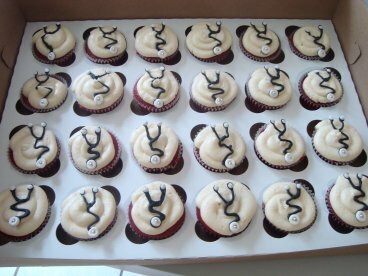 The full order was for 2 dozen red velvet with the stethoscopes, 1 dozen Irish Car Bomb cupcakes, 1 dozen chocolate with chocolate ganache, and 1 dozen orange cupcakes with vanilla bean frosting. I thought it was a pretty good assortment for a party with a mix of adults, 20-somethings, and kids. Oh my gosh, these are absolutely adorable. 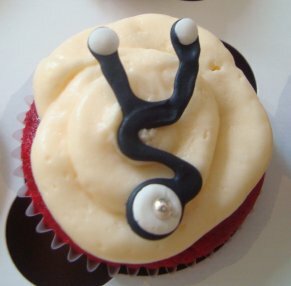 I don't t know anyone graduated from medical school, but I'll have to keep these in mind.